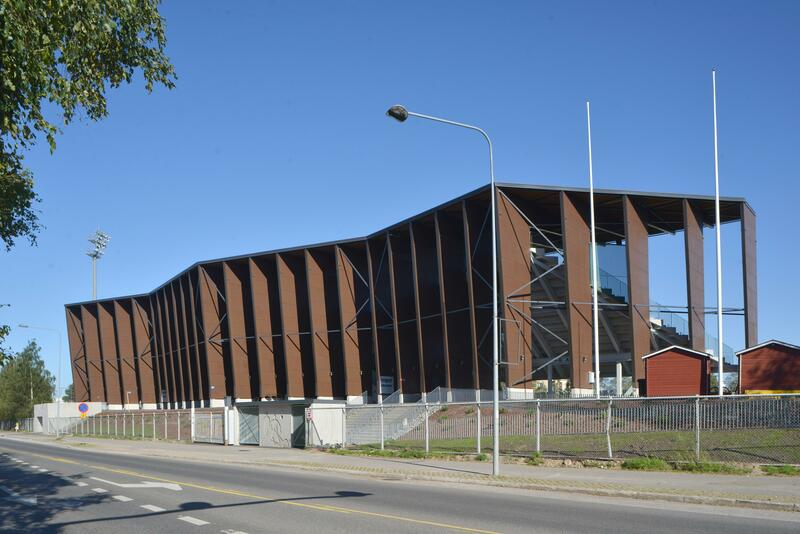 A new multi-purpose building was completed in Rovaniemi in July. 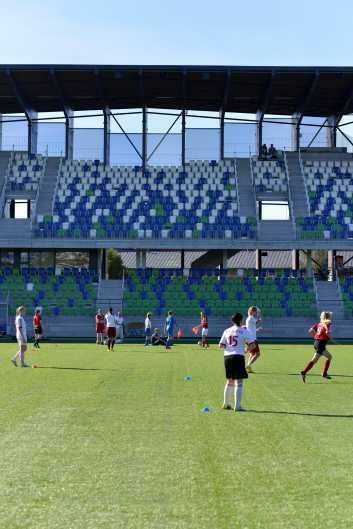 It houses a stand for 2,000 people as well as sportsmen’s changing and washrooms. It is an essential part of a central sports arena in the city centre of Rovaniemi. 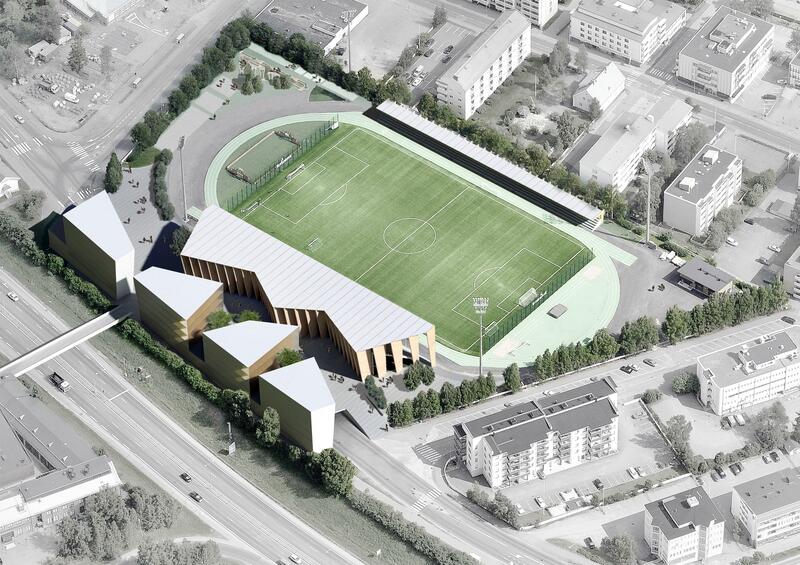 Despite the short summer in the Polar Circle, they play Finnish Premier League football there. 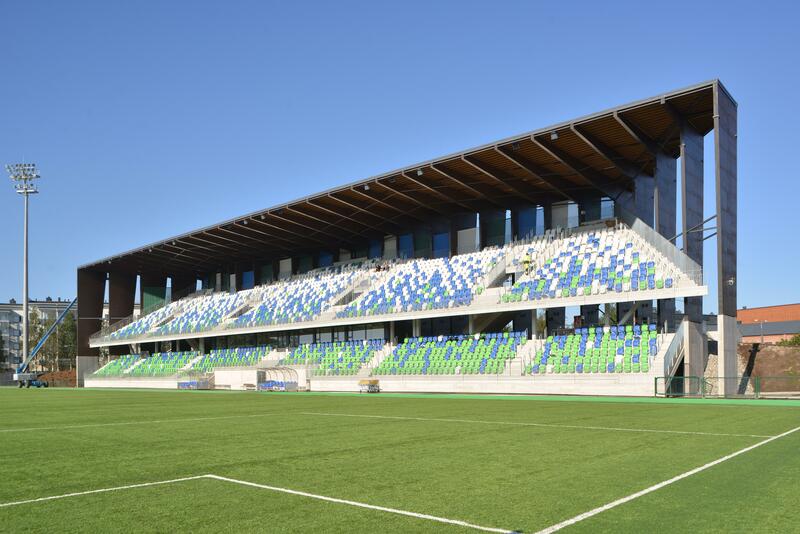 Rovaniemi football club has given an excellent performance in front of the new stand. Almost sensationally, the team is fighting for the Finnish championship. The city of Rovaniemi was severely destroyed in the second world war. As basis for the reconstruction, architect Alvar Aalto designed the Reindeer horn city plan for Rovaniemi 1946. 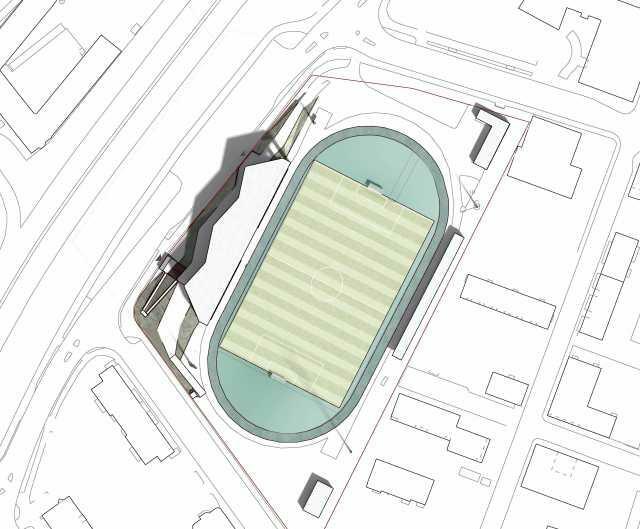 The central sports arena forms a reindeer’s eye in the city plan. The central arena has become the townspeople’s free-time venue for diverse activities, including track and field and football. 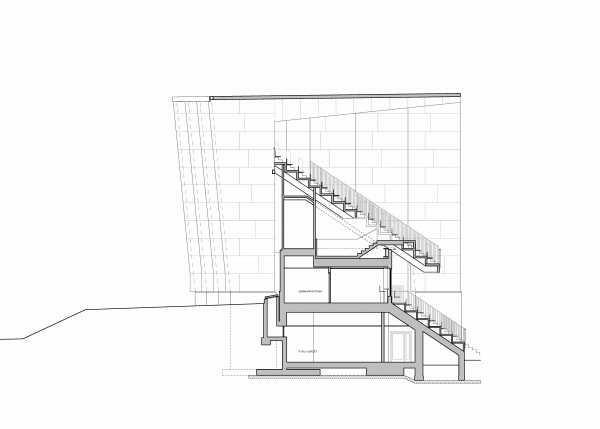 Our design, RAILO (‘crevasse’), won the architecture competition on the multi-purpose building in 2012, and the city plan was drawn based on it. In addition to the multi-purpose building, the plan proposed residential and office buildings that, once completed, will outline the winding, crevasse-like street space. The further development of the competition proposal started in early 2014. The geometry, structures and materials of the building saw some changes in the follow-up phase. The statuesque multi-purpose building shows far to the city surrounded by fells. The main trusses with steel framework and plywood upholstery form the zig-zag façade of towards the northeast. 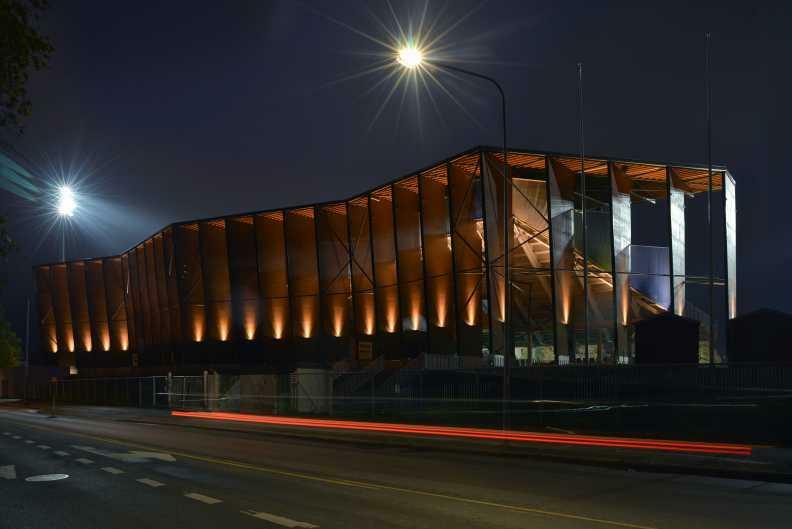 Rising from the surface of the arena up to 19 meters’ height, the main trusses form a powerful visual motif changing, like a kinetic sculpture, depending on the lighting comfort and visual angle. 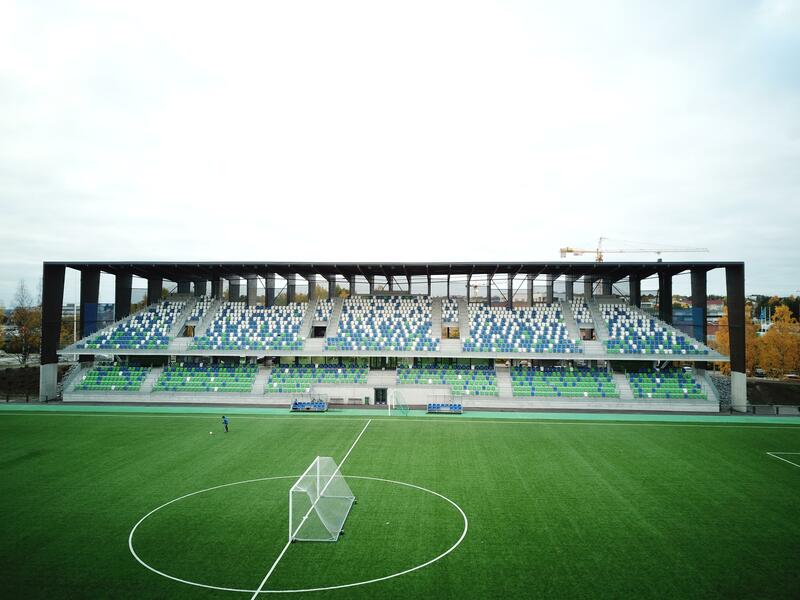 Seen from the arena, the graded stand with a concrete structure creates a fell landscape dotted with colourful seats and wind nets. The crowd arrives through the entrance building from Poromiehentie street. The concrete walls of the building display modulor footballers in real size. 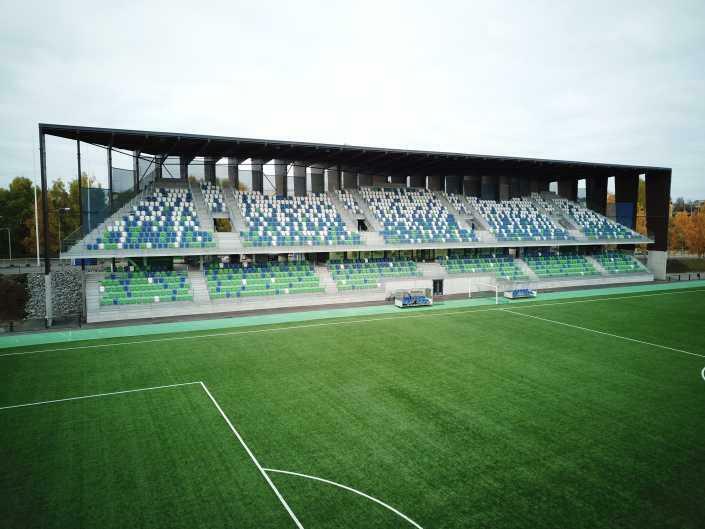 The upper stand is divided into three sections, which creates an intense atmosphere. 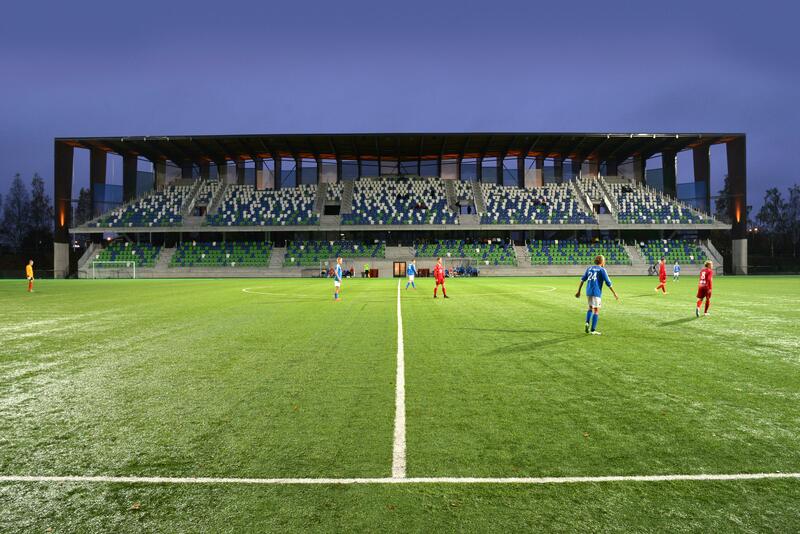 The division of the stand can also be used to keep visitor and home team supporters apart in international matches. 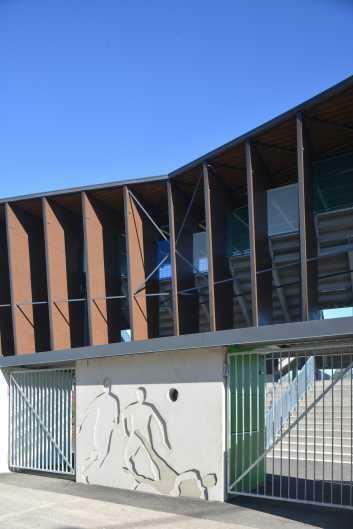 Athletes arrive at the building through an entrance tunnel that is connected to Poromiehentie street. On the field level, underneath the stands, there is an 80-meter gateway along which the wash and locker rooms, dance classroom, warehouses and service rooms are located. The gateway can be used for running practice. 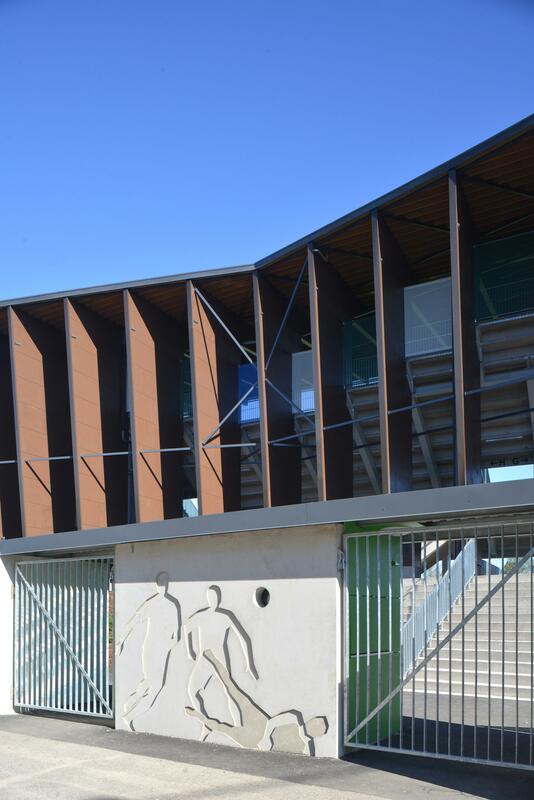 The area holds various places for exercise, and their users utilize the changing and washrooms of the stand building year round. 31 main trusses bear the upper stand, built of concrete elements, as well as the roof covering with a glued laminated structure. Together with the concrete elements, the steel frameworks of the main trusses and their standing supports form a sandwich structure with a width of over 90 meters in parallel with the arena. The reach of the roof covering is 14 meters at most. The overground primary structures are shop-fabricated steel structures compiled of standard-dimensioned steel profiles. The primary structure of the stand is formed by steel frameworks located in modules of three meters, as well as by HEA and HEB beams. At the front of the heated part of the stand, the HEA and HEB beams lean on a 600mm high HEB beam the size of the stand with steel column piers, and on the vertical members of the steel framework in the back. The ground mass is mainly made of a cast-in-place concrete structure; in part, multicore slabs were used as the slab structure. 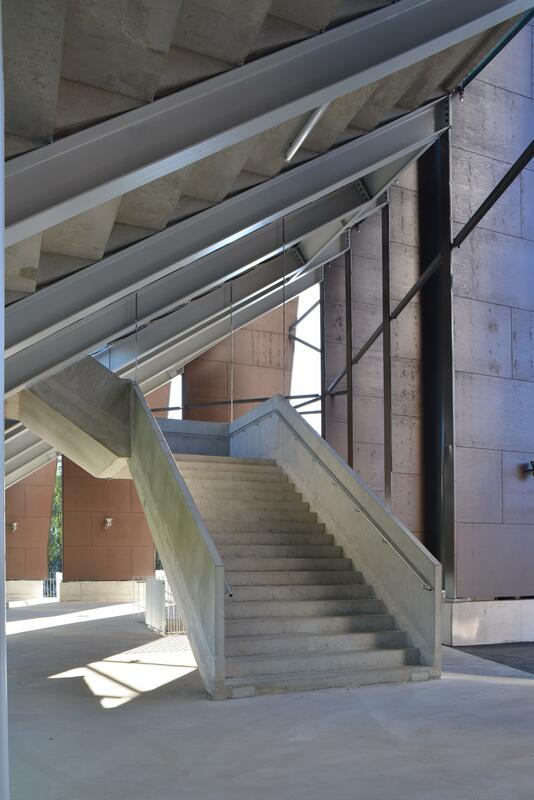 The gradation of the stand and the stairs leading to the stand are prefabricated reinforced concrete. The module of the stand gradation is 800mm in depth and 500mm in elevation.